"Easy recipe for a warm winter meal. This recipe makes enough to fill a 10-inch cast iron pan just like my Grandma used to do." Whisk together the flour and 1/2 teaspoon of salt in a bowl. Cut the shortening into the flour mixture with a pastry cutter until the mixture looks like coarse crumbs. Drizzle the ice water, about 1 tablespoon at a time, over the mixture and gently work the water into the dough with your fingers. Add more water as needed until you can gather the dough together in a ball. Wrap the dough in plastic wrap and refrigerate for 30 minutes. In a saucepan, mix together the turkey, onion, cream of potato soup, cream of chicken soup, water, and mixed vegetables. Bring the mixture to a boil; reduce heat and allow to simmer while you prepare the crust. Cut the dough in almost equal halves. Roll the larger piece into a circle on a floured work surface and fit into a 10-inch cast-iron skillet. Roll out the smaller piece into a circle to fit the top. Pour the hot turkey filling into the bottom crust. 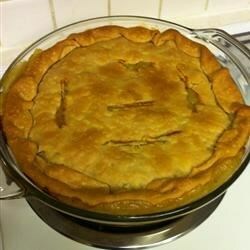 Place top crust over the filling, crimp the two crusts together with a fork, and cut several slits in the top with a sharp knife. Bake in the preheated oven until the crust is golden brown, about 45 minutes. This recipe is delicious! Best pot pie I have ever tasted! To make things a little easier I used store bought refridgerated pie crust. Will be making this often for my family!